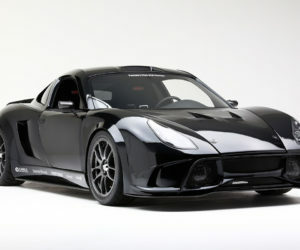 Editor’s Note: While Factory Five Racing’s GTM has achieved an enthusiastic following in recent years, it hasn’t always been a favorite of the company, partly because this mid-engine project is a fairly complicated build and thus requires more tech support. So company president David Smith at one time even considered discontinuing the car, but changed his mind after seeing a spike in popularity. 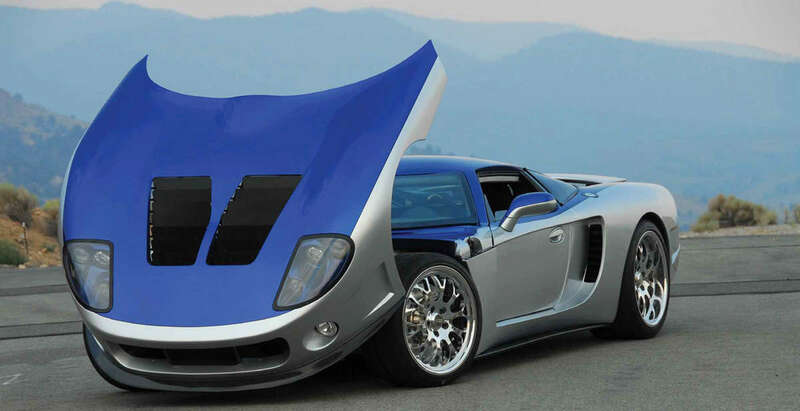 One possible reason for this resurgence is that since it’s unique in design, and not a replica of any particular car, the GTM serves as an excellent starting point for customizing, allowing car builders to express their creativity in a number of remarkable ways (highlighted in a few other car features in previous issues). Which leads us to Larry Ramsey’s beautifully finished car. We first met him at the SEMA show in 2014, and the car wasn’t quite done. 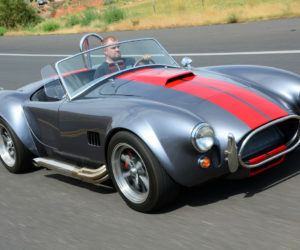 Once completed, though, he towed it in an enclosed trailer all the way from Utah to our offices in northern Nevada so we could shoot it for a feature. So we thank you Larry, not only for your initiative, but also all your craftsmanship and dedication to this project. Before getting into the details of my GTM buildup, let me share a bit about my personal and automotive background. I was raised near Martinsville, VA, which is a mecca for hot rod cars, as this has been the site of a NASCAR track since 1950s. My family started a rental go-kart track in 1960 that continued through 1965. For last three years we had private kart racing. My first car was a new 1965 GTO, which had Tri-Power induction. Next was a 1968 Firebird which lasted until my first daughter was born. That was when my hot rods went away and my first marriage ended in divorce. Fortunately, my second wife loved cars and anything fast, which included a Triumph TR7 that she ran without oil and soon expired. 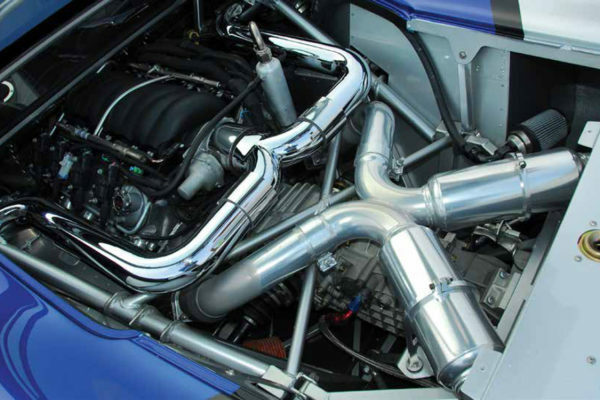 I contacted a race-car builder in LA and he installed Buick 3.8L V-6 with a turbo, 350 trans and Nova rearend. After all the bugs were worked out of the car, my second wife wrapped the TR7 around a tree. Sadly, both expired in 1984. After recovering from that event, I began looking at kit car magazines as I was wanting to build something that wasn’t like everyone else. But I couldn’t find anything that I liked as most kits didn’t look finished even when completed. So I purchased a 1974 Porsche 914 in 1991. I installed a Chevy 327 in 1994 and I still own this car. I fought clutch slipping and radiator overheating for two to three years. 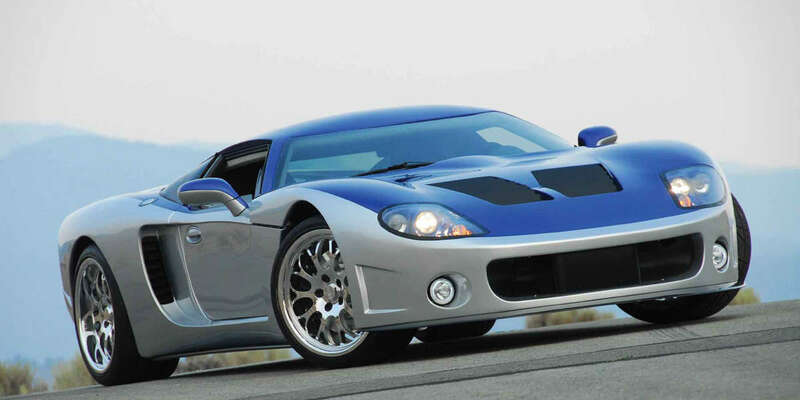 The clutch was fixed by local shop in Salt Lake that performed repairs for local drag racers. I’m still running same clutch. The radiator was fixed by going with replacement from Renegade Hybrids of Las Vegas. The 914 is running the stock 901 transaxle. I ran it at the Salt Flats in 2000 and joined the 130 mph club. I plan to take 914 back to Salt Flats after replacing the transaxle with an upgrade that includes an overdrive. I plan to join the 150 mph club. During 2005 I was looking at a new project for a 1965 GTO, which would have included a modern suspension, brakes, AC, LS engine. 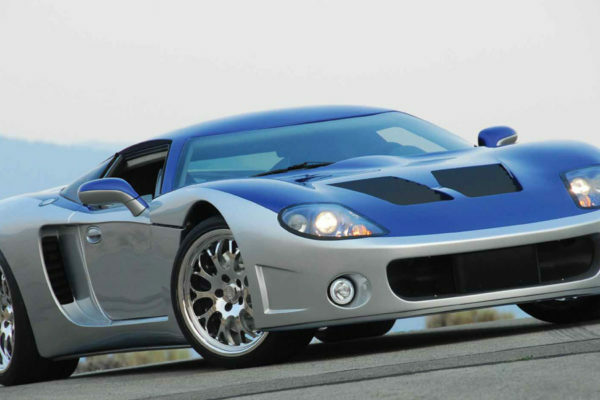 Then I ran across an article about a Factory Five Racing GTM. I contacted FFR and found out there were track days Labor Day weekend at VIR and a prototype GTM would be on display. I attended event and experienced the loyalty of the current owners. 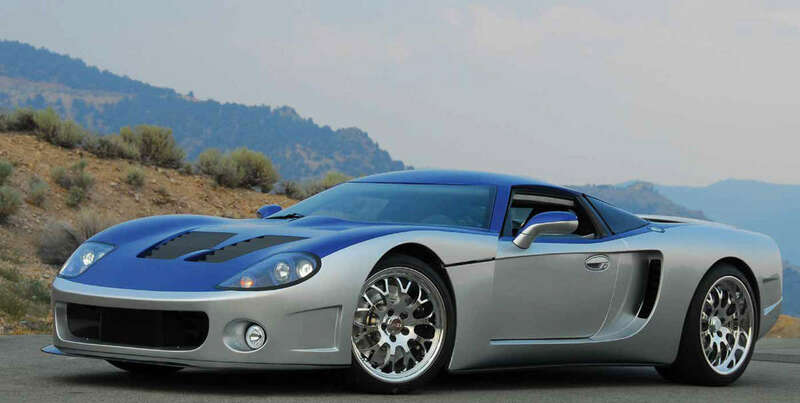 The GTM was a beautiful car and looked 100 percent complete, and could have come from a custom builder. So, I ordered mine the next month. In January 2006 I purchased a 2000 C5 Corvette donor on Ebay, and received the kit in April 2006. 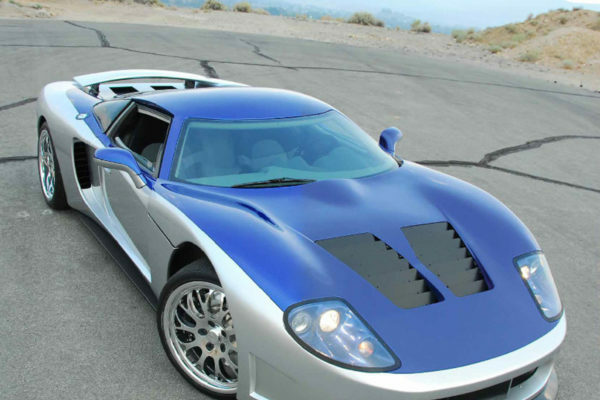 During my visit to VIR and viewing the prototype GTM, I met a guy that stated he would provide labor for zero dollars and only charge for parts. I had the frame and all panels powder coated chrome and clear. After six months, I realized that this guy was only copying the frame and planning to build his own car, so I removed everything from his shop. In the Summer of 2007 I had a job in Nebraska that was to last for months and I’d only work eight hours for five days. That lasted for two days and we were working six to seven days a week. I was lucky enough to find a builder in Kansas, which was around 130 miles from my work location. When the car was delivered the frame had the suspension partially installed and barely rolled around the shop. North Race Cars had the car for five months and got it running enough to drive into my enclosed trailer. 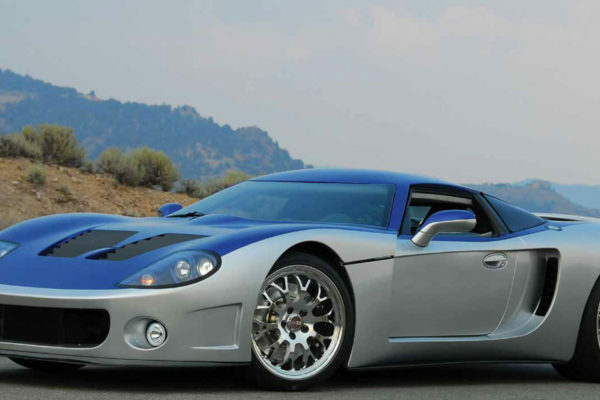 In March 2008 I took the GTM to a builder in VA that was six miles from my Mom’s place. By May 2010 I took the GTM to VIR for a shakedown run. I ran three laps and the clutch would not disengage, which ended this event. I later found out that the transaxle shifter assembly was installed wrong. So I ordered replacement parts, and installed them in the transaxle. It has been working great ever since then. In September 2010 I took GTM back to VIR and ran three sessions for a total of around 35 laps (which would have been around 100 miles). 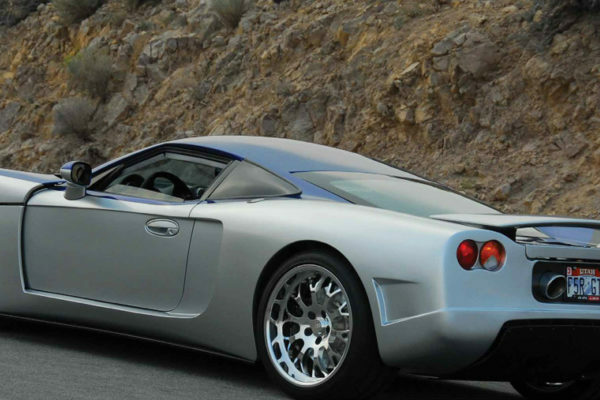 During this outing the GTM had a donor LS1 and I decided that 350 hp was not enough. 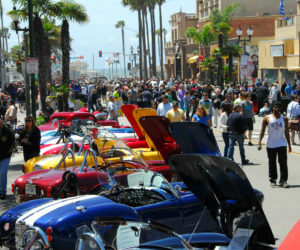 I researched and contacted Mast Motorsports for an LS3 with 600 hp. After receiving the engine in 2011, I installed it in 2012. In 2012 I finally decided on the paint for car: blue/silver, and this endeavor only took 12 months. In 2012 I contacted Hermance Design for a rendering of two-tone paint and interior. After about ten renderings, we came up with the right two-tone colors. The interior only took one rendering. In May 2014 my car was painted PPG Vibrance Blue and Silver. I picked it up in July 2014 and traveled to New Orleans for a review by LED lighting experts for entry into the 2014 SEMA show. That company already had a project for SEMA, but did provide advice for LED lighting. 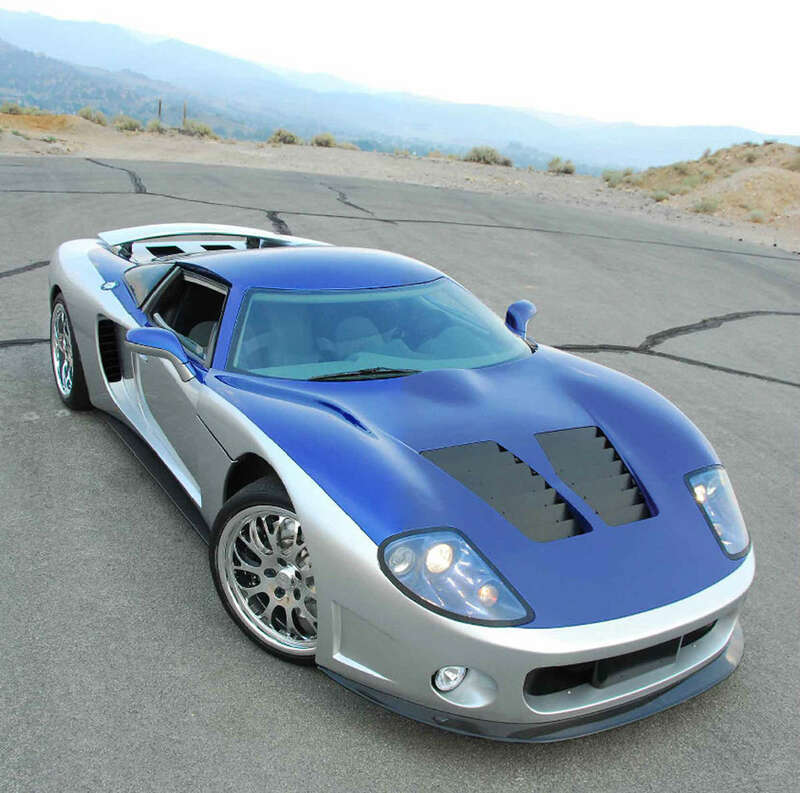 I then traveled to Mast Motorsports for a review of my GTM and checkout of their engine software. 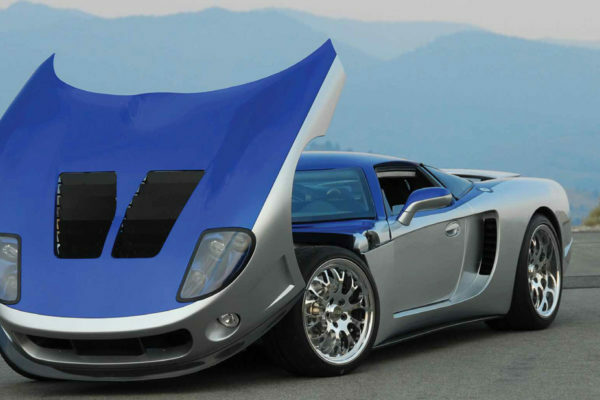 Mast agreed to sponsor my GTM at SEMA 2014. Then I traveled back home to Salt Lake City to begin crafting of the custom interior. Car was worked on for 35 straight days until Monday morning of SEMA, and I hauled to show after only two hours of sleep. 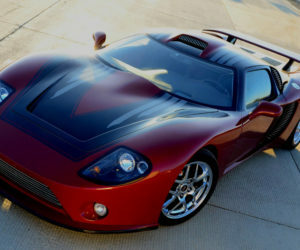 My GTM was displayed in Vendor Featured Parking C3, on the ramp next to Ford’s large booth area. After the show I drove GTM to the LINQ hotel and casino for the SEMA Ignited for display after the show. There are many videos on YouTube that captured my car. Later on, my GTM was entered in the Utah 2015 Autorama and won first place in class. And then in July 2015 my GTM was accepted into the Art of Concours, Kansas City Institute and the car was well received. I have had it in about three other shows and there is usually a crowd around car during the complete show. In 2016, I plan to drive car to local shows rather than trailering. • Custom all leather Interior by Dale Hancock Upholstery as per the Hermance Design rendering. • Speedhut Gauges with a background that’s blue and lettering is silver, just like two-tone colors of the car. Hermance Design provided background color and fonts for Silver. • Alpine head unit with GPS. • Passport C5 radar system. 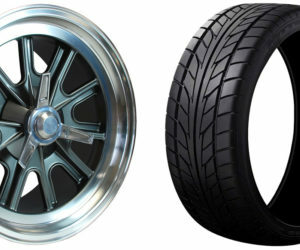 • CCW 19’’ wheels, 9” front and 11” rear with Nitto tires. • The Brake Man (TBM) big brakes. • ISIS multiplex module wiring assembly. 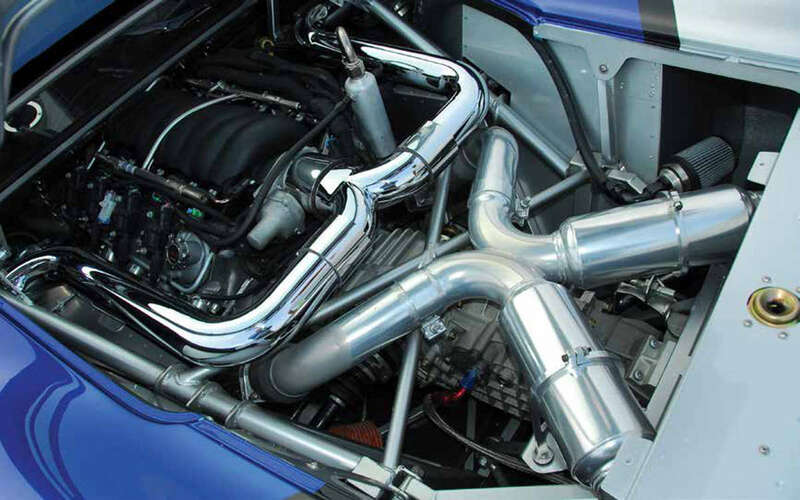 • Mast Motorsports LS3, handbuilt and dyno tested 605 hp/ 525 lb/ft at 7000 rpm. • Functional ram-air induction system that was custom fabricated and installed with filters. Functional ramair system fabricated/ installed for front/rear brakes. • PPG Vibrance paint, Blue Heaven & Silver. • Frame and all panels powder coated with chrome/clear. • Porsche GT2 transaxle with 6 speed LSD. Prototype shifter from California Motor Sports. • 2.5 boxes of RoadKill installed in interior. • Body inside painted with Lizard Skin and then painted with silver paint. • Digital rendering by Ben Hermance Design for body and interior. • Splitter and rocker extensions by FFR. • HID headlights and LED lighting for turn and rear. • Customer radiator inlet box fabricated/installed by last builder. Which included brake inlets. • Custom door glass support added for glass support and better rubber fitment. • Custom surge tank in rear adjacent to engine. • Battery disconnect lever/switch fabricated/ installed in remote location.